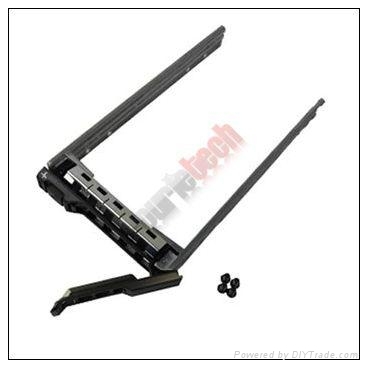 Dell G176J / Y961D / 0G176J / G281D / 0G281D / WX387 / T961C SFF Small Form Factor 2.5" SATA caddy for Dell Poweredge T310, R415, T410, R510, R515, R610, T610, R710, T710, M600, M605, M610, M610x, M710, M710HD, R715, R810, R815, M805, M905, M910, R910, M1000e, MD1120, MD1220 - Brand New. This tray is the new angular version of the KF248, and can be used as a substitute for the KF248. This tray will accept any 2.5" x 1.0" SFF Small Form Factor SAS hard drive.